Faculty Member Caron Daley has been elected to President-Elect Designate for ACDA-PA. Dr. Daley will begin her duties immediately, planning for the Fall 2017 ACDA-PA Conference, then assume the duties of President-Elect on July 1, 2017. Daley states "ACDA supports both our daily and our transformative work as choral conductors. I look forward to the possibility of serving you and of working together to imagine an even greater future for the choral art in Pennsylvania." Caron Daley is Director of Choral Activities and Assistant Professor of Music at the Mary Pappert School of Music at Duquesne University, where she conducts the Voices of Spirit, Women's Pappert Chorale, and University Singers, and teaches undergraduate and graduate choral conducting. She holds a D.M.A. (Choral Conducting) from the University of Toronto, an M.M. (Choral Conducting) and M.A. (Vocal Pedagogy) from The Ohio State University, an Artist Diploma (Voice) and B.M. (Music Education) from Western University, and an Associate of the Royal Conservatory of Canada Diploma (Voice). 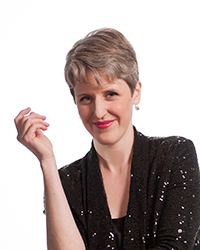 A busy performer, Caron regularly guest-conducts district choirs and sings with Pittsburgh-based Voces Solis.